VulcanConnect is SST’s plug-and-play WiFi-based networking platform. The system enables users to transform nearly any sensor into a wireless node that can be remotely monitored with zero programming and network configuration. An easy to implement integration & automation platform. This means no software engineers or IT personnel needed. No configuring of wireless network names, IP addresses, or WPA passwords – just turn it on and start collecting data. Sensors can be either user or SST provided. The system also turns legacy instrument controllers, for example those with 0-10V or 4-20 mA output, into wireless nodes as well. SST combines select components into simple to purchase and deploy packages. This gives the user a turn-key, self-contained VulcanConnect system. Add additional interface modules to scale up with your need. For those desiring a lower cost alternative to Package 1, we offer a combination of the router and lighter weight system, where data is stored and accessed in the cloud. Just navigate to a website from anywhere in the world to see your sensor data. Although slightly more complex to set up, this is the lowest cost way into a VulcanConnect system. It contains a single interface module and a software applet to view your data on your own PC, tablet, or smartphone. Windows, Mac, and iOS are supported. This package is not scaleable to multiple interface modules, but can be later upgraded to Package 2 or Package 3. 1. VulcanConnect Panel – this hardware device and accompanied GUI act as the central hub for the VulcanConnect system. When sensor modules are initially turned on, they automatically find and connect to the nearest VulcanConnect Panel. 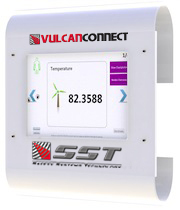 Sensors automatically start streaming data in real-time and the VulcanConnect Panel displays the sensor feed to its 10 inch LCD. The Panel can support up to 128 simultaneous sensors. It can also contains an optional camera system that drives a unique gestures-based user interface. This is especially desirable for those facilities where touching instruments is problematic, for example a biosafety level laboratory. For those that do not have a need for a full-feature local solution as offered by VulcanConnect Panel, SST offers VulcanConnect Router. This device connects to the same VulcanConnect Interface Modules, but functionally replaces the VulcanConnect Panel with a VulcanConnect Router. This lower-cost solution sends all sensor data to a website hosted on the internet vs. a local display and storage device. This provides the advantage of easy worldwide access to your data from any internet connected device – a PC, tablet, or smartphone – and is secured through password protection. The lower cost VulcanConnect Router does not provide a display or local data storage, and does require a hard-line internet connection for gateway purposes. For remote applications, the VulcanConnect Router can be alternatively outfitted with a 3G cellular modem. The VulcanConnect Interface Module is the hardware that turns any sensor into a plug-and-play wireless node. Its input offers signal conditioning for raw analog signals (BNC connector), receipt of output from pre-conditioned analog sensors (e.g. 0-10V or 4-20mA), and typical digital interfaces (RS-232). Standalone data logging is built-in – storage is based on SD memory cards and is user upgradeable. A WiFi chipset and antenna link the VulcanConnect Interface Module to the VulcanConnect Network. And lastly the VulcanConnect Interface Module accepts battery power, making the system truly wireless when needed. The VulcanConnect Network is what makes the system extremely easy to setup and configure. The VulcanConnect Panel, Router, and Interface Modules are WiFi enabled, but are designed and configured to run on their own private VulcanConnect WiFi network. Other computers by default cannot join the network which improves overall security, but more importantly, running its own network means that there’s no user setup involved. The system is preset to talk only to other VulcanConnect devices in the network. The network can be connected to another LAN (through the Hydro Panel or Router), but this must be a hard-wired connection or through ASI’s optional 3G cellular modem. This ensures easy connection and better security of your data. Of course, in Package 3, the VulcanConnect Network effectively is disabled as there is no Panel or Router to manage the private LAN. For true plug-and-play, upgrade to Package 1 or Package 2. ©2019 Safety Systems Technology, Inc. All Rights Reserved. This website may contain other proprietary notices and copyright information which should be observed. All other trademarks mentioned are the property of their respective owners.